Like most people, I do not particularly enjoy hospital visits. Aside from the unpleasantness of fearing for the health of a loved one, the discomforts that evade me are many. From the confrontation of the inevitable death that awaits us all, but also the idea of potentially suffering a painful and slow departure. The pungent yet unrecognisable smells that trigger all kinds of nasty and speculative ideas about their source. The disease stricken gaze of zombie-like patients. The chemical smell that soaks the walls, and eventually seeps into the back of your tongue where it lingers for days. The food. That packaged piece of white bread with a slice of butter, accompanied by a carton box of orange juice made for kids with a monkey on it that has just as much sugar as a coca cola. That food that makes airplane food taste like anniversary dinner. Hippocrates, the central historical figure in Greek medicine during the 5th century BCE, authored a group of medical treatises known collectively as the Hippocratic Corpus. It was Hippocrates who first attempted to separate the practice of medicine from religion and superstition. 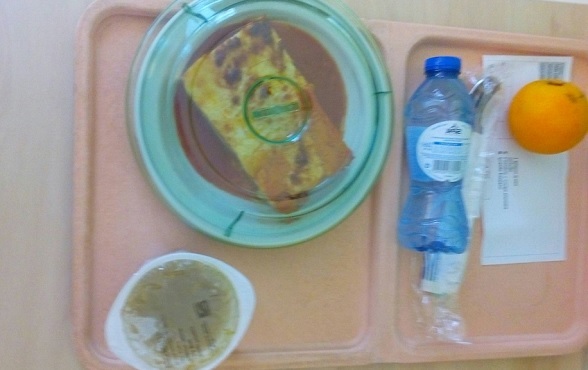 WHAT IS UP WITH HOSPITAL FOOD? I have asked myself this question for many years now. 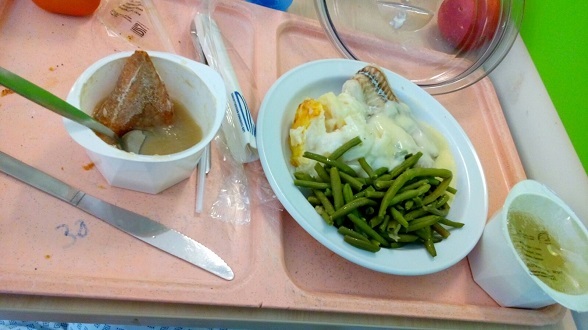 Why is hospital food so bad, so unhealthy, and so tasteless? Why are patients with diabetes, low blood pressure, cancers and even heart disease eating jello and a glass of milk for breakfast, and pasta with spam for dinner? Many years ago when my grandmother was in the hospital for an extended period of time, my fascination (or more like vexation) for the awful food they were feeding her was born. She would complain about it all the time and having never abandoned her Mexican spirit until her last breath, she would order us to sneak her in some “carnitas (fatty pork dish)” and a bottle of tequila. Regrettably, we never did. But even though this may not have been great nourishment for her decaying health, it sure was not any worse than the lifeless, processed, eatable substances she was being fed. The reality of hospital food is grim. Most hospitals have set meal times three times a day, which bring food from a catering centre somewhere far away and usually from the cheapest possible ingredients. It is not rare that food is delivered frozen to the hospitals, and then simply reheated on site, and passed around in a trolley. Yes, just like on the airplanes. Food is probably one of the biggest comforts we have in life. When we are feeling sad and emotional, there is nothing like a delicious piece of homemade chocolate cake to turn that frown upside down. When we can feel that winter flue coming, nothing like a warm bowl of soup to quench our feeling of weakness and misery. When we have a stomach bug, ginger tea is the best pain soother. Food is medicine for the body, for the mind, and for the soul. So why are hospitals ignoring the power that food has to heal, and accelerate recovery? Over the last few decades, study after study, after study, after study, after study, after study, after study, after study…has been published upholding the inextricable link between a healthy diet and good health. It is not a theory, it is science backed by hard facts: you are exactly what you eat. This summer, the Lancet published The Global Burden of Disease Study (GBD), which is the most comprehensive worldwide observational epidemiological study to date and assesses the leading causes of death worldwide. Diet was found to be the second highest risk factor for early death after smoking. Amongst the highest risks for early death are diabetes, high blood pressure, obesity, and high cholesterol, all of which are associated with a poor diet. It will only take one web search to find countless articles from trusted medical sources such as the British Medical Journal, the Lancet, or the World Health Organization (WHO) (just to name a few), to affirm the role of unhealthy diets promoting many non-communicable diseases. While this link has become irrefutable, what makes up “a healthy diet” is still constantly debated amongst different schools of health and nutrition, even if they all claim to be backed by the right science. The ambiguity that surrounds the discipline of nutrition is a major frustration and source of confusion for many consumers who seek to live a healthier life, avoid today’s common diseases, and live past the life-expectancy stats. So what makes up a healthy diet? According to the WHO, recommendations for a healthy diet include: eating more fruit, vegetables, legumes, nuts and grains; and cutting down on salt, sugar and fats (always choosing unsaturated over saturated fat). However, this is not a post about which of all the fad diets out there is the real one. There is enough good and bad science out there, and I believe this is something each person must decipher on their own through extensive research and personal conviction. But without even going into the different fad diets, carbs vs. fats, vegan or vegetarian – all “optimum health diets” agree with indisputable certainty that processed foods are bad for health. So why are hospitals still serving them to sick people? Why would an obese adult, an elderly person with osteoporosis, and a small child with leukaemia all follow the same diet? Even without a medical background, I am a human with common sense and basic understanding of health to be certain that this doesn’t make any logical nor scientific sense. I am not trying to advocate for food as a replacement for medical treatment. Never. But rather, I am simply questioning the absence of nutritional education in the medical discipline. If food is the second determinant of health (after smoking), then why are nutrition and medicine two completely separate disciplines? This reality is as absurd as the coca cola vending machines found in most hospital halls. While there are many astonishing success stories about somebody who beat cancer by eating ginger or juicing for a year, it seems like too big of a risk for anybody to treat their life-threatening disease by going on a carrot diet. But this is not to say that the determining role that food has on our health is widely overlooked by healthcare professionals – globally. Even as the famous words of the father of medicine resonate throughout the ages; “Let food be thy medicine, and medicine be thy food”… thousands of years later, the very discipline that exists with the sole purpose of protecting the health and curing disease are still failing to live by this ancient philosophy. To learn more about the massive disparity between nutrition and health, I recommend you watch the documentary WHAT THE HEALTH. In an ideal world, Medical curriculae would teach preventative medicine rather than the current focus on treatment, your nutritionist would also be your cardiologist, meals would be prepared for each patient to nourish their specific condition, and hospital food would be rich in pesticide-free nutrients that would wake your appetite and make you feel better. 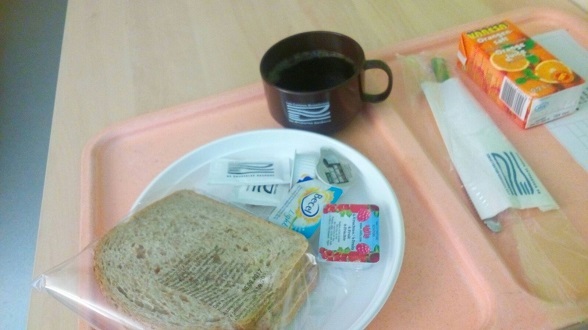 Hospital food would promote health. While my vision of what the future should look like may still be decades away, some hospitals have already started to pick up on some of these approaches, for example, the award-winning food programme of the Nottingham University Hospital (NHU) NHS Trust in England. NHU serves fresh and healthy meals made with local, seasonal and organic ingredients that work to improve patient’s health, boost the local economy, and reduce the environmental footprint of their food chain. This hospital provides high-quality meals that support patient recovery by giving patients a chance to choose a meal that is appetising to them, as well as by consulting doctor’s prescriptions under certain patient’s medical conditions. For more examples of hospitals that are at the frontlines of implementing healthy and sustainable food systems across Europe, check out Health Care Without Harm Europe’s recent publication on the subject. In an ideal world, Medical curriculae would teach preventative medicine rather than the current focus on treatment, your nutritionist would also be your cardiologist, meals would be prepared for each patient to nourish their specific condition, and hospital food would be rich in pesticide-free nutrients that would wake your appetite and make you feel better. Photo:Ana-Christina GaetaLicense: CC BY-NC 2.0. Dinner, day 1: one slice of ham, bread and butter for dinner, with a side of coffee and an orange for dessert. Photo:Ana-Christina GaetaLicense: CC BY-NC 2.0. Breakfast, day 2: the same as dinner without the ham. Photo:Ana-Christina GaetaLicense: CC BY-NC 2.0. Lunch, day 3: Fish, potatoes, with green beans. In my opinion, the only meal that could be considered a healthy meal for “health promoting” standards is picture 4. 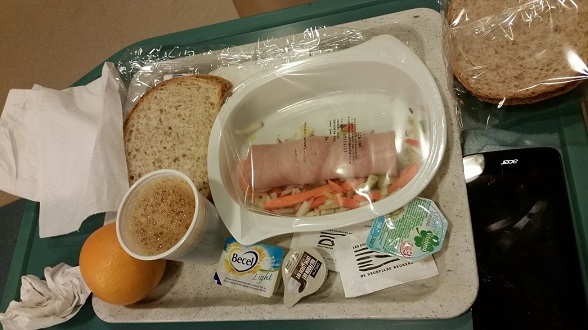 Nevertheless, these meals demonstrate a positive evolution of hospital food. Considering the trust that society has in the health profession to provide us with health advice, hospitals have the opportunity to use their own food programmes to educate patients, their families, and employees about the link between diet and health, and the lifestyle benefits of eating a healthy diet. I look forward to a future where hospitals improve the quality of food served to sick people, play a more active role in educating patients about healthy lifestyles that help prevent disease, and have taken major steps to integrate the power of nutrition into medical treatments. Until that day comes, I advise you not to take nutrition advice from your doctor, if you are lucky they get some of it right; they may recommend fruits and vegetables compressed into pills and sealed into a jar. Who knows if nutrition information will become less confusing, or if we will ever rely on our doctors to guide us to good health. But if I can provide some un-qualified advice is that health is not a diet, it’s a lifestyle. And the best thing about being healthy is that you don’t get sick, and then you never have to spend time in a hospital. It’s worth it.